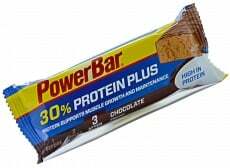 Power Bar 30% Protein Plus is your readily available source of high quality protein that will start muscle recovery and repair immediately after exercise! 30% Protein Plus is a must-have for athletes and fitness-oriented people who need a convenient source of protein. Your muscles work hard for you whenever you exercise, and in return you need to take care of them by providing the right tools that they need for repair and recovery. Each bar is packed with 30% of a TriSource Protein Blend (casein, whey and soy protein) that will help fuel muscle growth and recovery after your training sessions. Aside from its rich protein content, Power Bar Protein Plus contains healthy carbohydrates that will fill up your energy reserves so that you can keep performing without using up all your energy reserves. Power Bar Protein Plus also contains 5.8g of dietary fiber that will clear the way for smooth and efficient digestion and absorption of proteins, and minimize the occurrence of digestive discomforts. Whenever you need a quick protein snack, grab a Power Bar Protein Plus. Did we mention it is delicious and has the taste/quality guarantee of Nestlé PowerBar? Have a question about 30% Protein Plus? What is it, what does it do, how and when to use or something else? Ask us. ALLERGEN INFORMATION: Traces: Nuts, peanuts, gluten. Other Ingredients: Calcium caseinate (from milk) (21%), white chocolate (18%) [sugar, cocoa butter, whole milk powder, emulsifier (soy lecithin), flavouring], oligofructose syrup, invert sugar syrup, fructose syrup, whey protein (8%), skimmed milk powder, soy protein (2%), flavourings, emulsifier (soy lecithin). 1 bar per day after training. WARNINGS 30% Protein Plus : As part of a varied and balanced diet and a healthy lifestyle. Consult a doctor before use if you have a health problem. Keep out of reach of children.